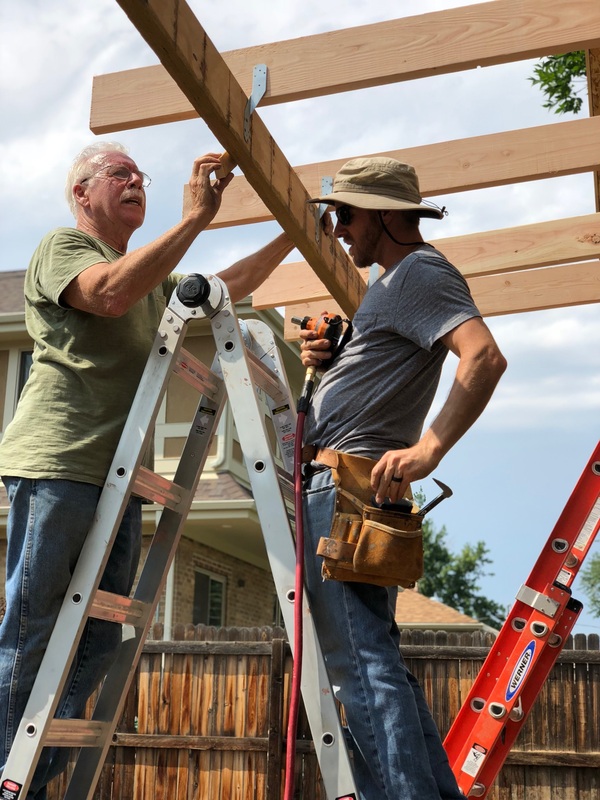 When Scott and I were dreaming about building our tandem house, we used to spend the weekends going to open houses in the neighborhood. 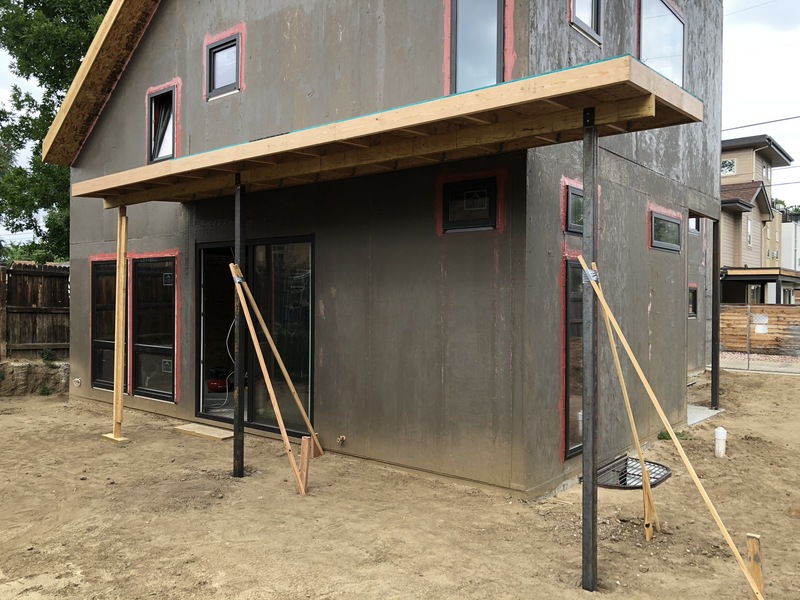 We were curious to see the standard of material finishes that we would be held to in order to compete in the highland residential market. There was one house in particular that had these chunky wood stair treads and metal fabricated railing. We loved the untraditional look and knew that we wanted a similar aesthetic in our house. Little did we know how complicated planning, designing, fabricating and installing these stairs would be. Although it was a long process, we couldn’t be more happy with how they turned out. We went with solid hickory treads that Scott finished with a natural polymer-based finish. After three coats and sanding in between, the treads were ready for install; just in time for Thanksgiving. Our family could rest assured that we had railings. Not only did the stairs look fabulous but they were safe for all the little ones to run up and down when they played hide and seek! We made a bold chose by going with concrete floors in our main living space. Although concrete floors are not uncommon these days, it took some extra planning because the floor sits above our basement. Meaning, the joists below the floors had to be doubled up in order to support the structural load of the concrete above. See our previous post on the pouring of these floors. After ten passes with a diamond grinder and a matte protective finish, the floors are beautiful and have a complex natural look. Even better, they are seamless, collecting little to no dust. They are smooth and easy to clean! On the second floor, we went with solid character maple hardwoods. We love the natural and bold look of these floors that are a far cry from the more traditional oak flooring that you see in many Denver homes. We went with porcelain hex tiles in the bathrooms and laundry room which ties in the concrete look from the main floor. And last, we chose carpet in the basement because it gives a comfortable and homey feeling for our guests when they come to stay with us for the holidays! This past Thanksgiving week our solar pv system passed a final inspection by the City. Going forward our Xcel Energy bill will start metering the solar power generated and used. We couldn’t be more excited to start using power off the grid and to start tracking our savings. We ended up selecting flexible solar panels by Miasole call the FLEX series, specifically model FLEX-02N . 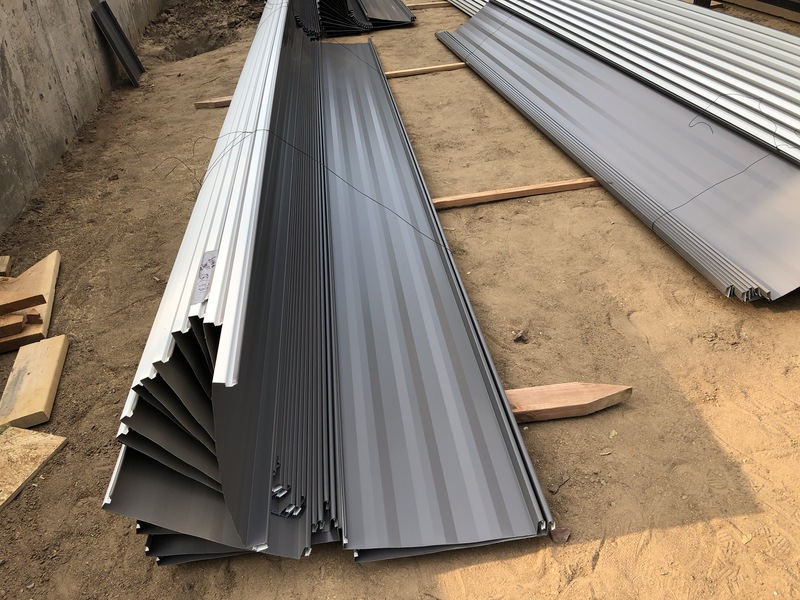 These panels are an ideal solution for our standing seam metal roof since these lightweight modules directly bond to the roof between the metal ridges. Not only do they offer a clean, sleek aesthetic but the modules will provide more than enough energy with the 16, 125-watts panels. These lightweight panels reduce the structural load of a typical panel array and they minimize wind resistance with its flat profile. Our generated energy will be stored in the SMA 3.0 KW inverter which has extra capacity in case we want to add more panels at a later time. 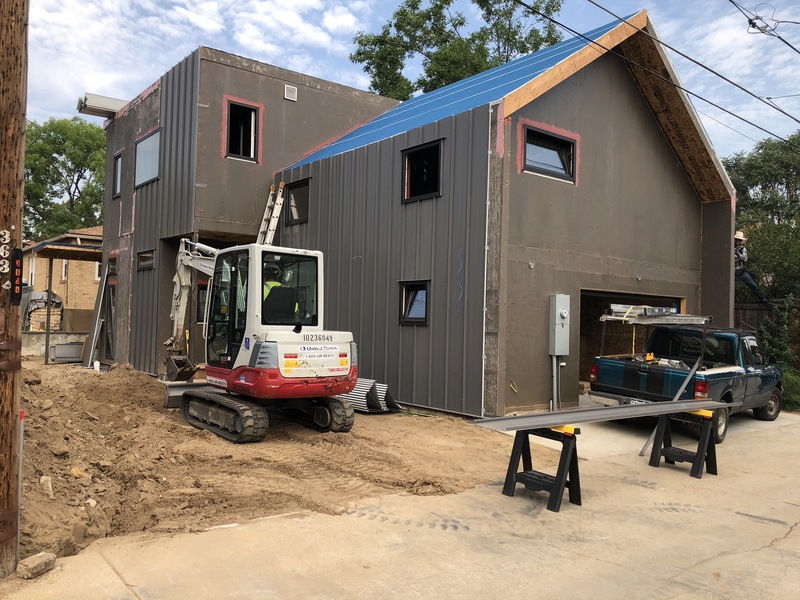 While Scott completed odds and ends of interior framing, to prep for insulation and drywall; the awning, metal roof and siding were getting installed. 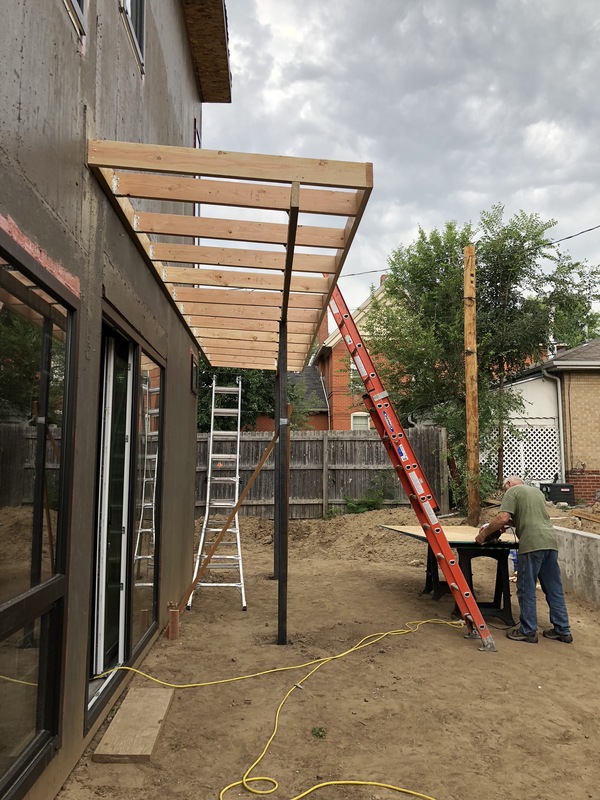 Scott and his step dad Jeff spent the weekend building the awning that will provide protection from the outdoor elements. The awning will eventually be cladded in metal and wired for lighting and outdoor speakers. 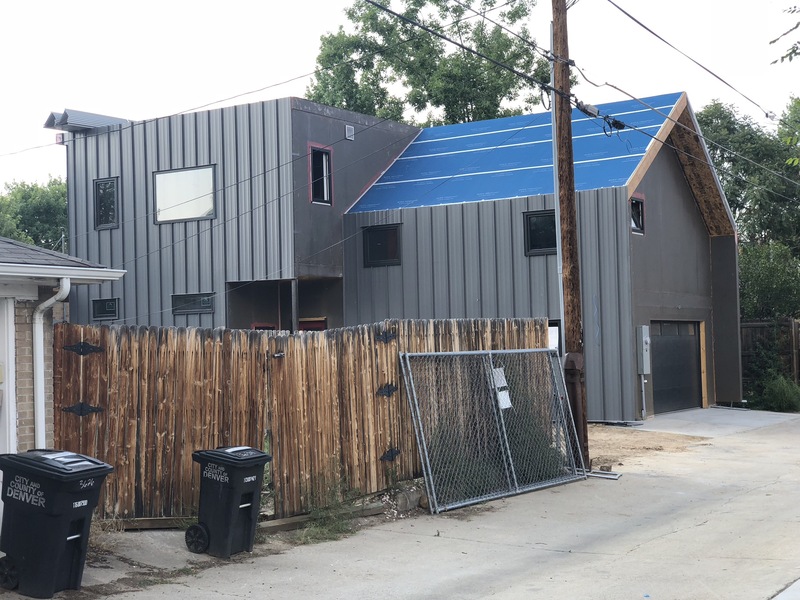 Roof installation was delayed for months because the subcontractor was so busy (a sign of Denver’s booming construction). This has made it difficult to stay on schedule and keep momentum going when contractors are so hard to track down. 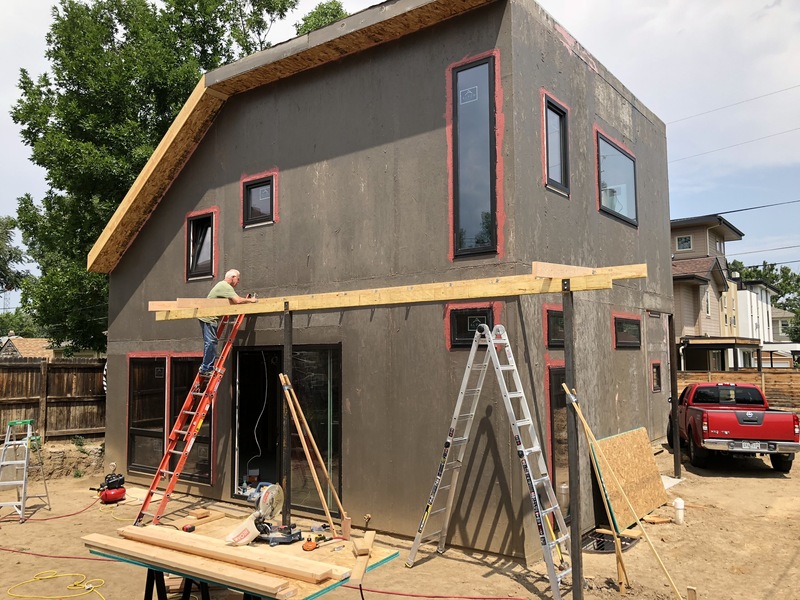 Additionally, it leads to a ripple of delays because things like interior insulation and drywall are dependent on a completely dried in house. Luckily we finally got the roofing contractor to site and now things are moving along faster than ever. 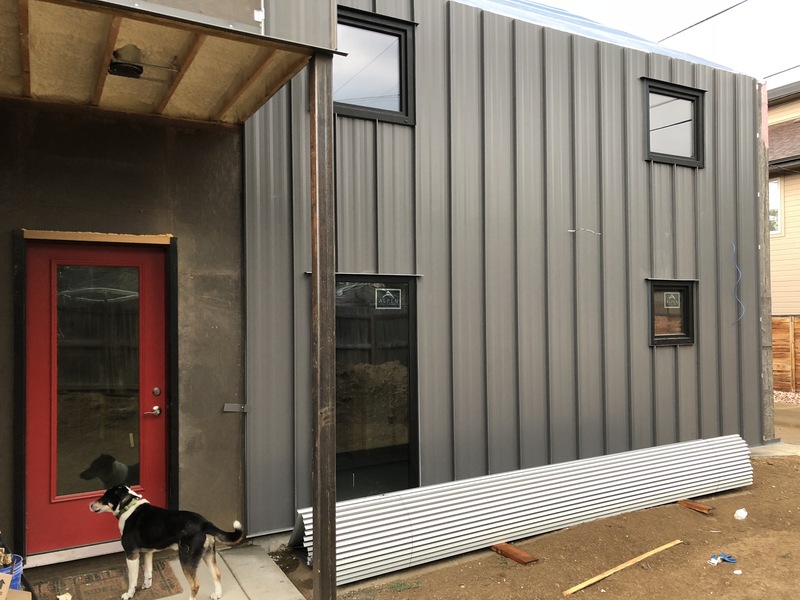 In just a week, the metal roof and siding went up. 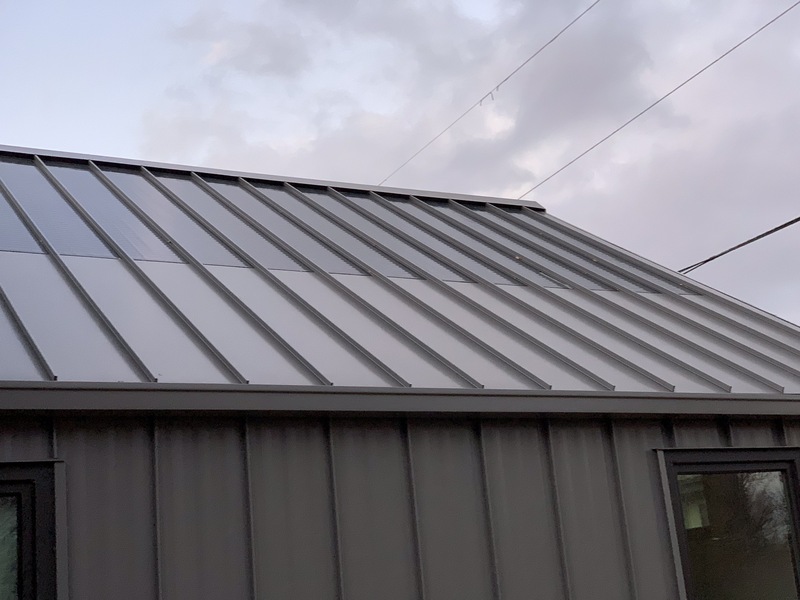 We chose metal standing seam material because it is a superior product that will stand the test of time, and will allow easy installation of our thin film solar panels. 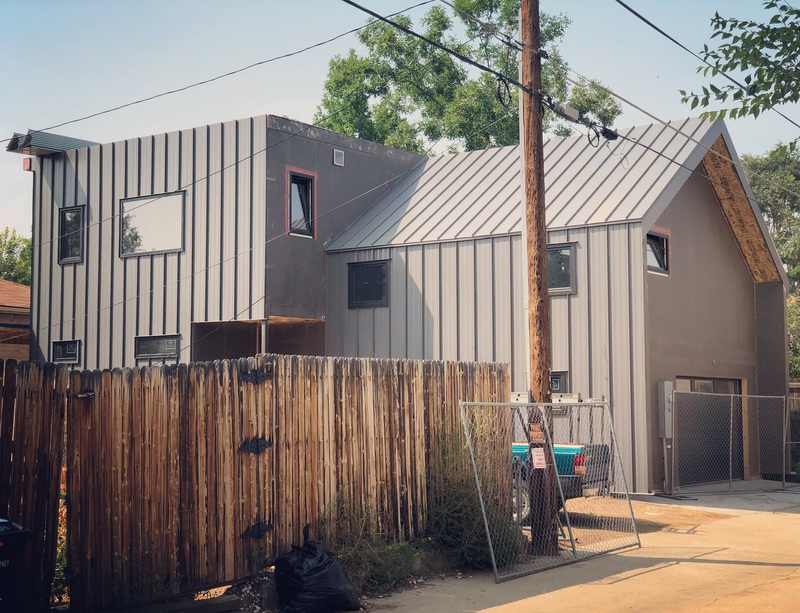 Our original design intent was to use flat panels on both the roof and facade (for a clean look) but upon recommendation from the contractor; we ended up incorporating striated siding. 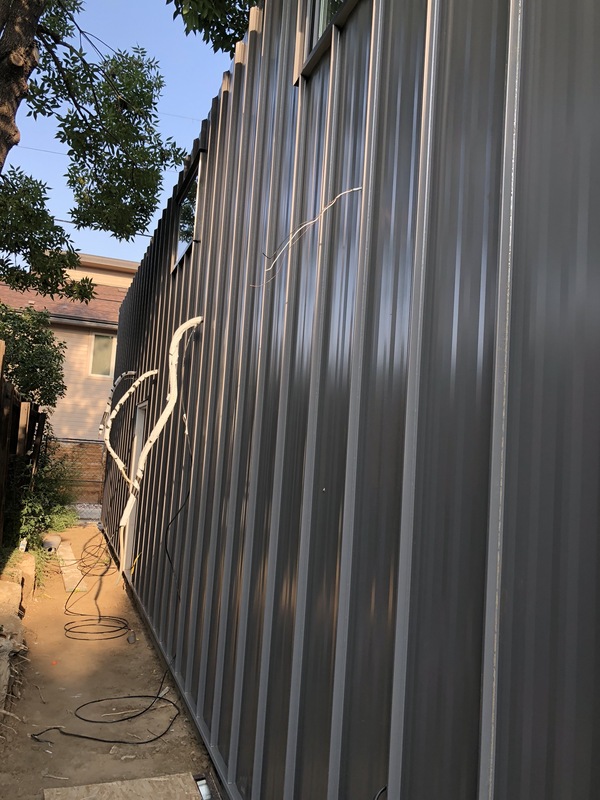 Since the structured wall panels are not completely flat and uneven in places, the metal siding, if not rigid enough, will bow out or dimple over time. 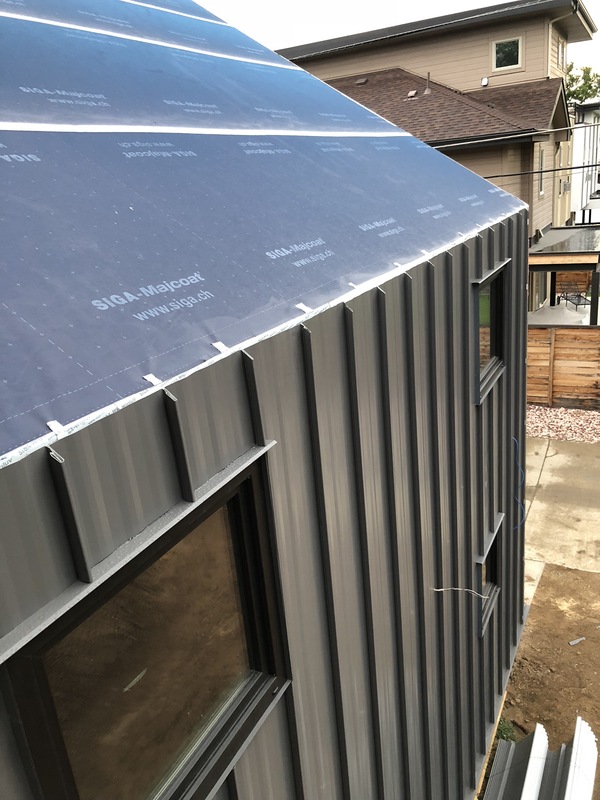 We obviously did not want that to happen so we chose to incorporate striations to make the siding more rigid. We kept the roof panels flat for two reasons: 1. 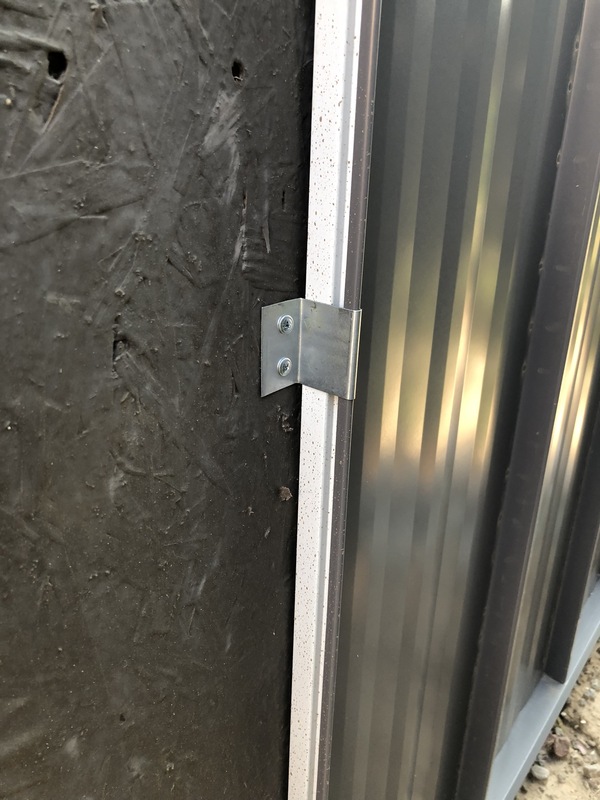 The roof is flat so we don’t have to worry about imperfections in the metal over time, and, 2. 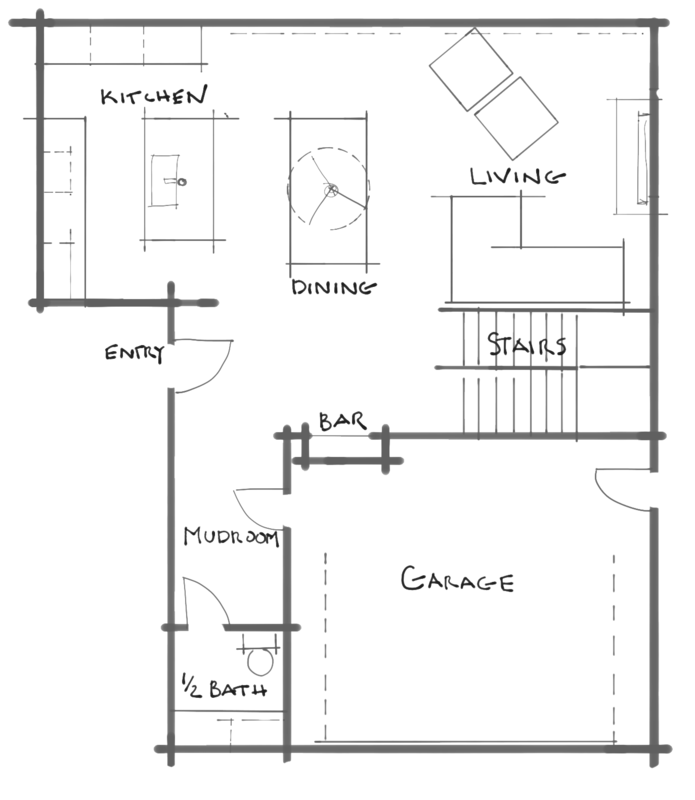 We will be installing solar panels that will adhere to the flat faces of the roof panels. 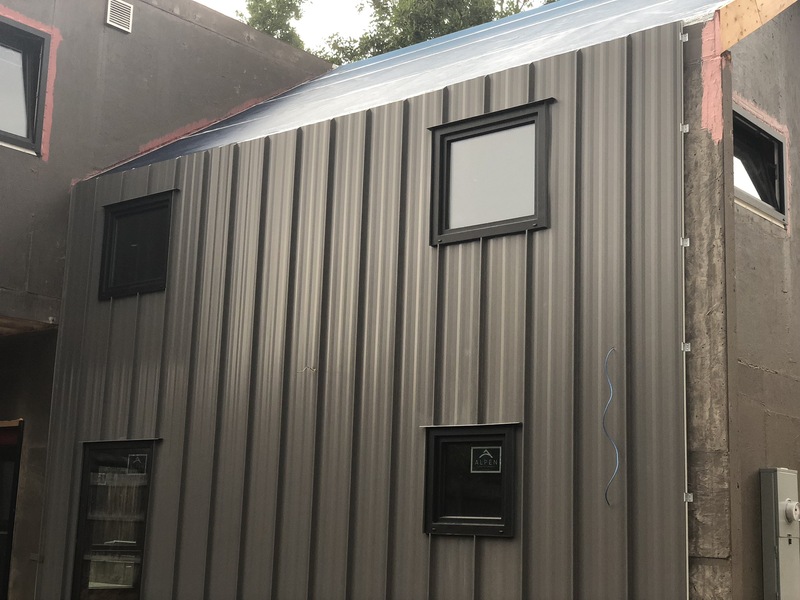 Standing seam siding is installed on all north and south facades. 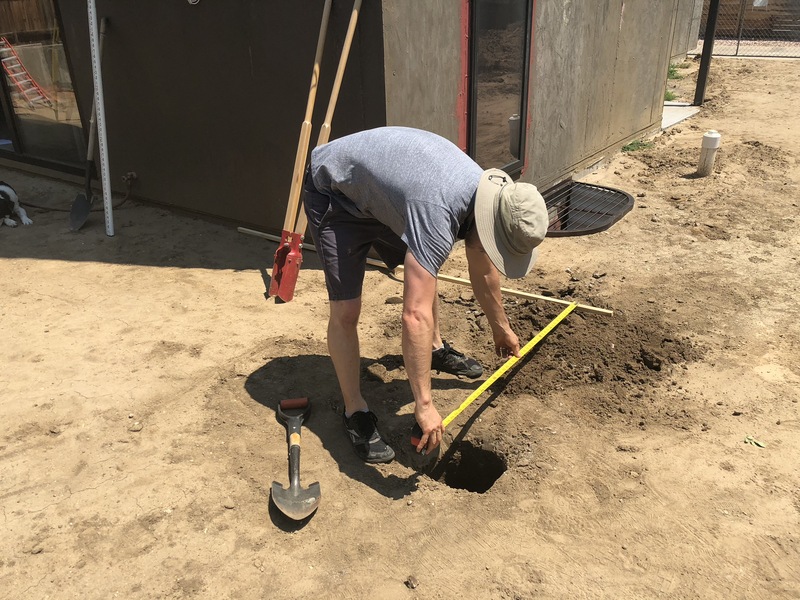 The metal material will hold up well over time as the hot southern sun beats down on it. 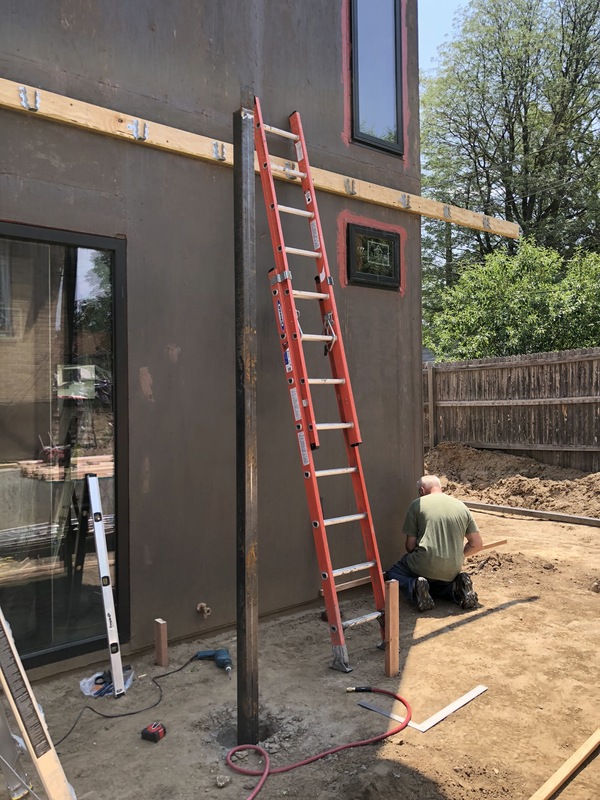 We will complete the exterior look with a cedar wood rain screen, installed on all west and east facades (stay tuned). Awning structure almost done. 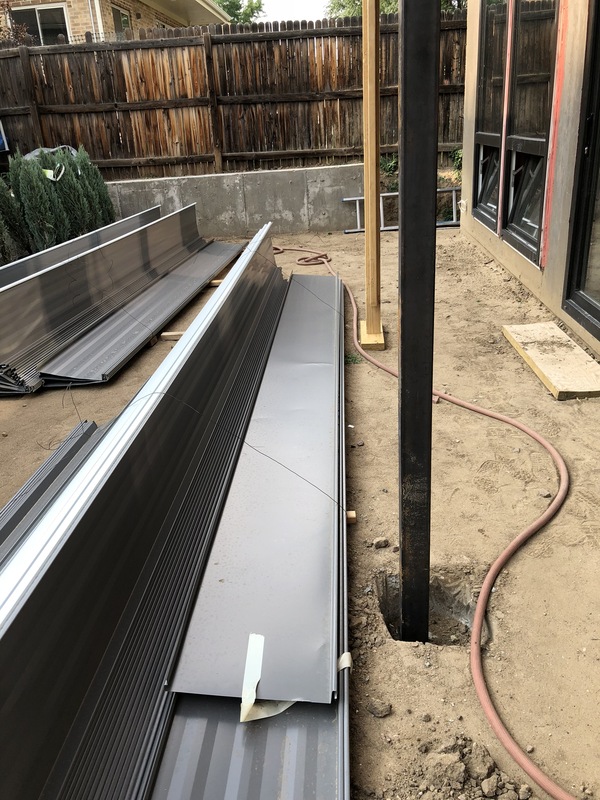 Need one more steel post and will get cladded with metal standing seam. North Facade. Awaiting HVAC systems.